There's a specific time of year to get discounts on almost anything on your shopping lists, says Lisa Lee Freeman, savings expert at the coupon app Flipp. 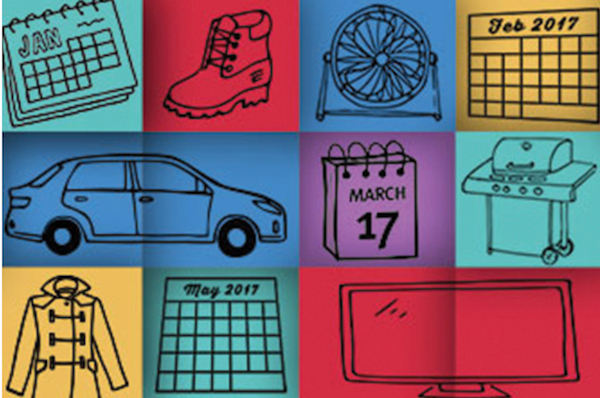 "National holidays, seasonal changes and new inventory models typically drive deals on products from clothing to mattresses to appliances." (Luckily, you could save money on insurance year-round!) Our guide to specific bargains can help you spend less every month. Each year, "White Sales" - a concept started in January 1878 - feature discounts on sheets, towels, bedding sets and pillows. President's Day weekend always brings markdowns on mattresses, and big-screen televisions - to make room on store shelves for new models introduced at the Consumer Electronics Show in January. "Better than Black Friday," notes Freeman. Winter gear, thanks to end-of-season promos on coats, sweaters and boots, skis and sleds, and - just in time for spring break trips - luggage. Next-generation computers often come to market in spring, so older ones are reduced. Also: some home goods, including carpet. Memorial Day weekend and Mother's Day deals typically include refrigerators, cooking appliances and sports apparel. It's wedding season, so sales abound on dishes, decorative tabletop items and other bridal-registry staples. Father's Day leads to bargains on home improvement and gardening tools. "Christmas in July" (aka the month when big-box stores slash prices to kick off the fall buying season) yields great deals on electronics. Department stores' "Fourth of July" sales also offer summer-clothing closeout deals. In the market for a new car? Dealerships refresh inventory in September when new models arrive, so look for markdowns. Labor Day weekend is the time for lower prices on school supplies, computers and backpacks. New smartphones also come out this month, so you could save on last-generation models. Backyard season comes to an end for most, so lawn and yard equipment, barbecue grills and outdoor furniture goes on sale. New household appliance models hit the market now too, so last year's models can be found for a bargain. Black Friday is the official time for discounted holiday shopping. Some of the biggest discounts are on small electronics such as tablets, activity trackers and cameras. The best deals come in refurbs, last-generation models and bundled gifts, such as video-game consoles packaged with games or cameras and accessories. Also cheaper: small appliances, kitchen gadgets and cookware. TOYS! Retailer markdowns deepen the closer you get to Christmas. And winter is home improvement's off-season, so discounts on anything related to home repairs are plentiful. Want more savings? See how much you could save by switching to GEICO. Get a fast, auto insurance quote today. Read more: Find out how to use your phone to save even more while you shop.